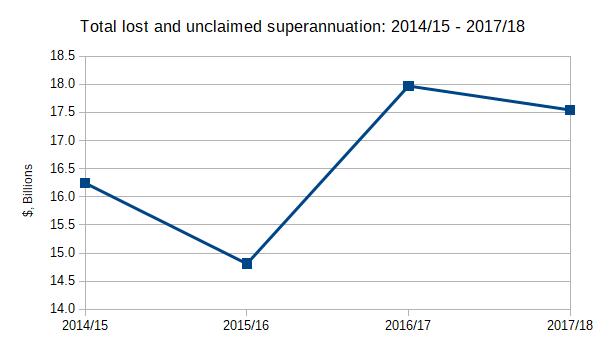 There is still over $17.5 billion in lost and unclaimed super, which is down by $426 million in 2017/18. But at the same time the amount of super held by the ATO has increased. ATO Assistant Commissioner Graham Whyte said it was a priority of the tax office to reunite people with their lost super. “We’re determined to help people find their super and I’m pleased to say that in the past financial year more than $3 billion was consolidated into active super accounts across the country,” Mr Whyte said. 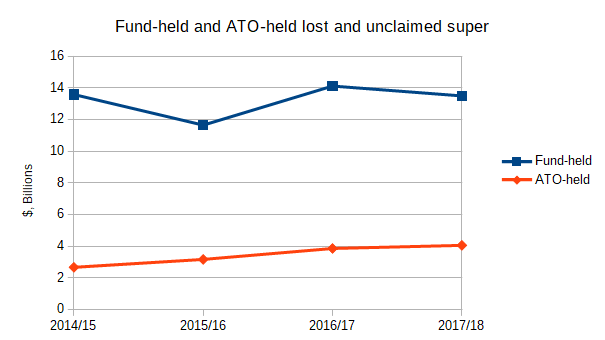 During 2017/18 the amount of superannuation held by the ATO increased by $197 million, while lost super held by funds decreased by $623 million. Lost ‘inactive’ accounts with super funds decreased by $862 million, while lost ‘uncontactable’ increased by $239 million. The bulk of the increase in super held by the ATO was in the ‘general, small and insoluble’ unclaimed category – up $180 million – with smaller increases in unclaimed super for temporary residents and Superannuation Holding Accounts (SHA). 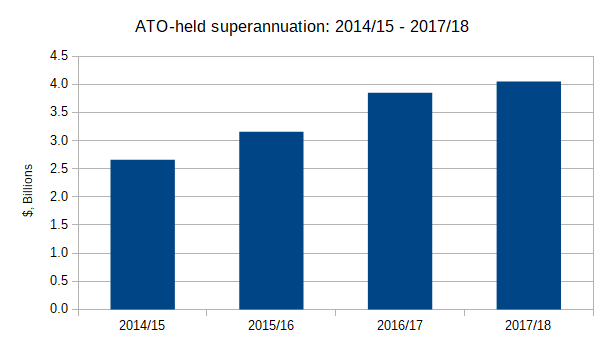 The amount of superannuation held by the ATO has been increasing each year of the last four, and is now over $4 billion. Recent Coalition and Labor governments increased the threshold, in stages, from $200 to $6,000. The Government has a Bill before Parliament which would expand the number of sub-$6,000 super accounts that need to transferred to the ATO. Though the Bill would also allow the ATO to proactively pay ATO-held super to a member’s active account. Assistant Commissioner Whyte said tax time was a great time to check on your superannuation, particularly if taxpayers are using myTax. Almost $3.2 billion – across more than 530,000 active, lost and unclaimed super accounts – was consolidated via myGov over the last year, according to the ATO. “We know that more than a third of Australians still hold two or more super accounts. While some people intentionally maintain multiple accounts, a lot of people are unaware of this, and that their super is possibly being eroded by fees,” said Mr Whyte.